M.T.N Design is the in-house design firm for PrecisionCraft Log & Timber Homes. M.T.N Design helps clients define and create spaces that work together. Design Manager, Celeste, sat down with us to share some logistics of designing interior spaces. Can you share some layout techniques that most clients do not think of on their own? Celeste: Something that clients do not initially think of that I believe is prevalent to the design of a home is the acoustics. It is certainly important to have a home that flows naturally. However, your design needs to acknowledge the noise levels that will occur in each space. Otherwise, it can disrupt the harmony of the overall layout. I try to keep louder areas like recreation rooms, laundry rooms, and utility closets away from quiet areas like bedrooms and studies to reduce acoustic disruptions. Of course, there are always clients who have special requests, like a laundry room located in their master suite. In these cases, I make sure to design those interior spaces to be well-insulated to compensate. Another design technique I practice for acoustics is lining up closets in adjacent bedrooms; by doing this, they act as sound barriers. Are there other areas where it makes sense to line up multiple space designs? Celeste: When we look at a project’s overall design, especially ones with multiple levels, there are often instances where it makes sense to line up systems within the layout for efficiency. Two such systems are chimneys and plumbing. Oftentimes log and timber home floor plans will have fireplaces set up in adjacent rooms. When designing interior spaces, we will draw the floor plan so the fireplaces use the same chimney system. We can also reduce the amount of plumbing that is needed by lining up or stacking bathrooms on different levels of the home. What logistics of designing stairwells? 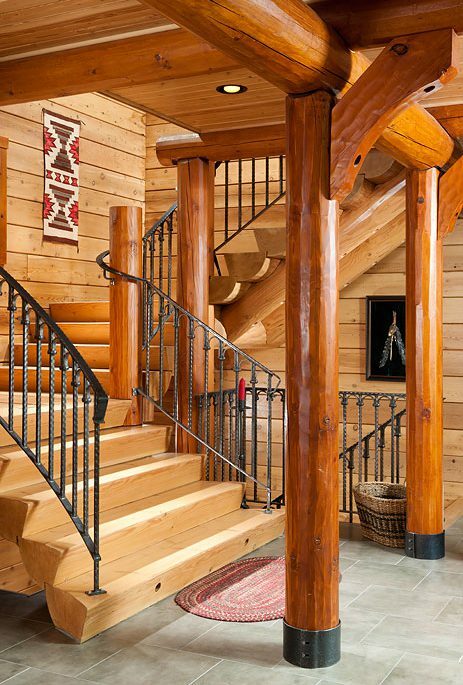 Celeste: Stairs are a big part of rustic log or timber design. In fact, in a lot of homes we’ve built, stairways have become one of the feature focal points of the design. Stairwell design, especially in homes with multiple stairwells, can offer a great opportunity for saving space. When homes have multiple stairwells, I line them up between levels to minimize their footprint. When designing interior spaces, how does lifestyle affect the layout? Celeste: There are several places in the home where a client’s lifestyle can affect layout and movement. For instance, many of our clients build their mountain-style homes on more rugged terrain, so I often suggest including a mudroom as a transitional space between a garage and kitchen. By doing this, it helps reduce the chance of tracking outside elements into the home. Ultimately, any home’s layout is designed to accommodate a client’s location and how they want to live within the space. Our design team works to define all spaces with the client when they start their design process. View our photo gallery to see unique interior spaces designed by M.T.N Design.